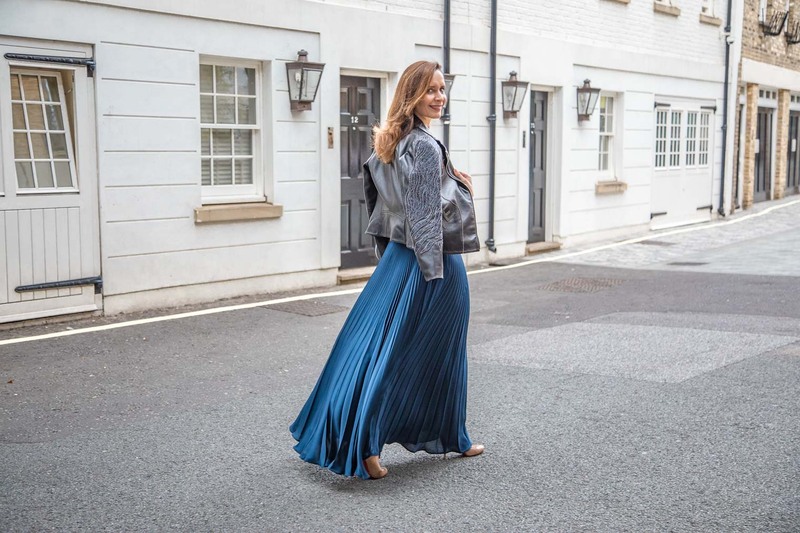 What to wear with pleated maxi skirt in the upcoming season? Maxi skirts can be a little intimidating to wear, especially in the fall. They are great and easy in the summer, as simple cami top or T-shirt would do, like on the first pictures below. But in the fall? 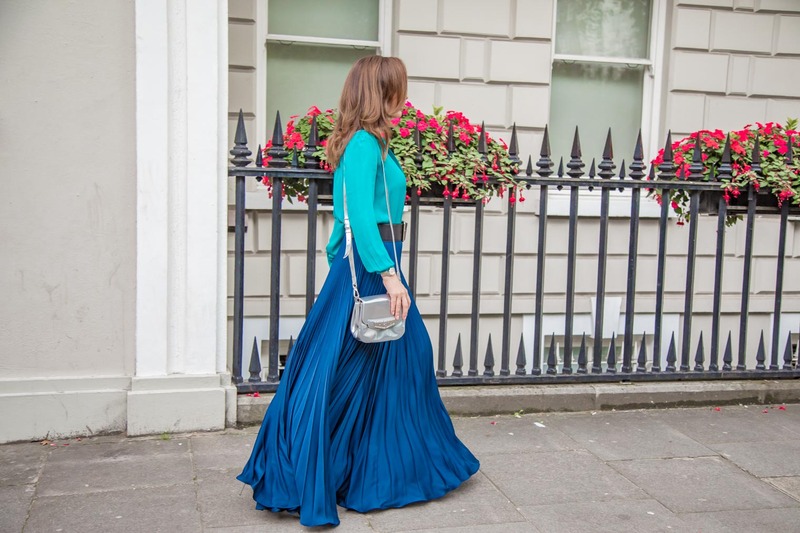 In summer I bought myself gorgeous Tara Jarmon maxi pleated blue skirt and I couldn’t stop wearing it. 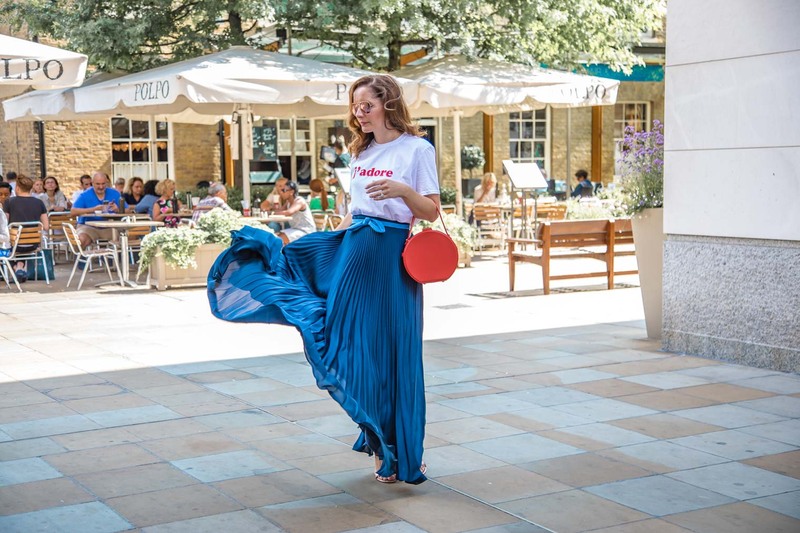 I have been a fan of midi or maxi skirts for some time now, but I find this skirt quite special. Not only it moves very gracefully, but also the colour is somewhat intriguing. It is royal blue and when it moves on the sun, it has a bit of a shine. Anyways, the point is, I love wearing this skirt and want to wear it through the fall as well. 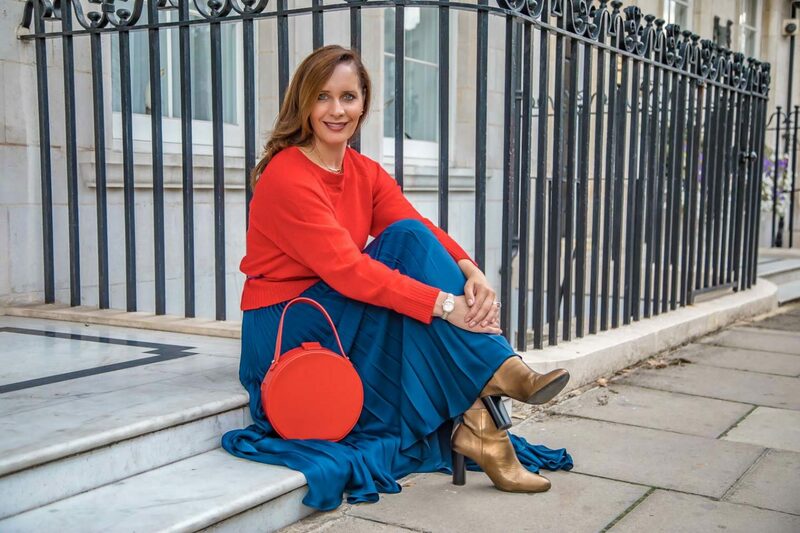 And I am sure many of you would have a maxi skirt from summer you would like to transition to autumn? Here are some tips about the styling. Swap t-shirt for a top with long sleeves. I prefer to wear everything tucked into the maxi skirt, as I think it is more flattering. 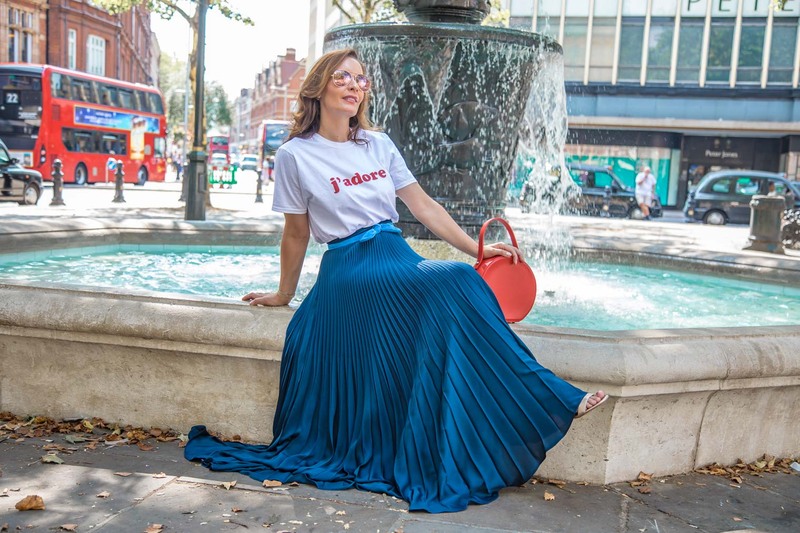 In the magazines or Instagram, you will see a lot of women wearing tops over a pleated skirt, but I just can’t help it. Even though I am aware it is really fashionable, how many women can actually pull this off and look chic? It adds kilograms and shorten your legs. I think it optically creates proportions that are not flattering, but if you like that sort of look, then by all means, wear it like that. Add a light sweater. Now that the temperatures are not low, light merino wool is ideal. I love Uniqlo sweaters, as they offer great range of colours and styles. But there are many more brands that have similar type of sweaters. 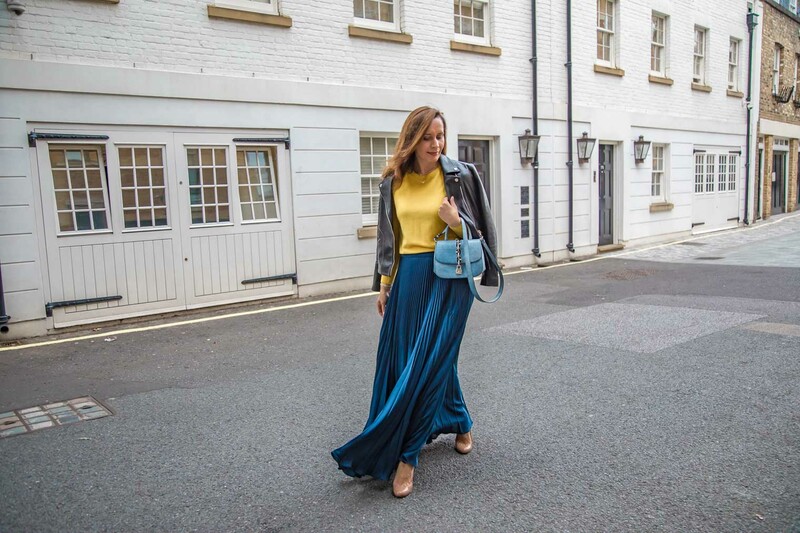 I love to combine my blue maxi pleated skirt with mustard yellow, red or other hues of blue. Add a leather jacket and be careful with the length. 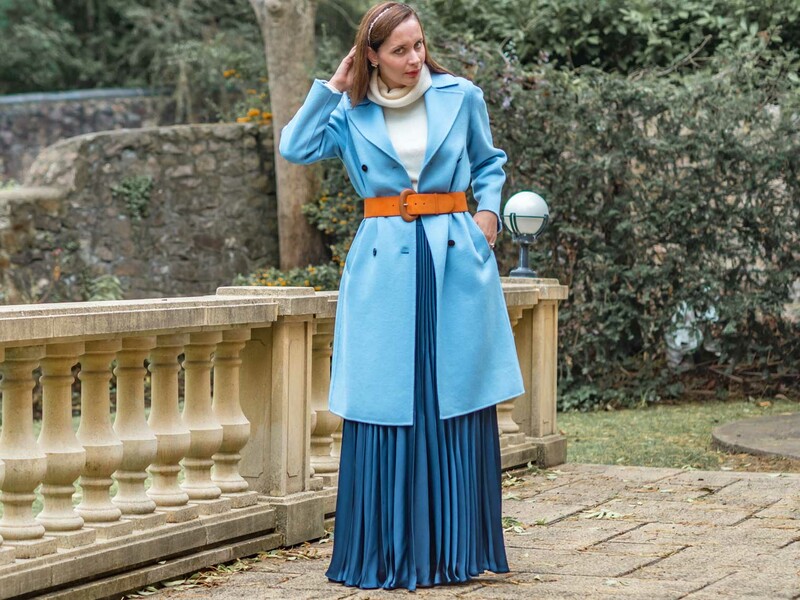 It is all about proportions and again, I see everywhere oversized jackets over the maxi pleated skirts, but I think it looks more polished when you wear something shorter. Biker jackets are amazing with any outfit and they add a bit of fall feel. You can also wear such skirt in the fall with very chunky knit, like this one. However if you do, make sure that if the sweater is a bit longer, that you at least tuck it in the front. That is how you keep your proportions in place. In the winter, add a good quality wool coat. Ideally long one and with a belt, like this one or this one. It doesn’t need to cover the whole skirt, but a long coat look slightly better. As the winter coat is more thick, good belt with put your proportions back in place. In terms of shoes, maxi skirt will look great with ankle boots like these, but higher boots will do the trick as well. Slouch shoes would also look good. I found these and these. Look No1. This is how I was wearing this skirt until recently. Simple t-shirt that I bought on Asos and Kurt Geiger shoes. I teamed this with Nico Giani round bag. The belt is from Tara Jarmon and I got it in summer sales. Look No2. Haute Hippie turquoise blouse and Givenchy belt. I teamed it with cross body Tod’s bag. I like the more relaxed look. Look No3. L.K.Bennett wool merino sweater in mustard yellow with Uterque leather jacket (similar to this one). All teamed with Louis Vuitton Chain It bag and Christian Louboutin simple beige pumps (similar here). Look No4. The whole look is Tara Jarmon. Shoes are Minelli (that you can’t see) and bag Nico Giani. Look No.5 Turtleneck sweater by Uniqlo, baby blue coat by Zara, belt is Ralph Lauren. 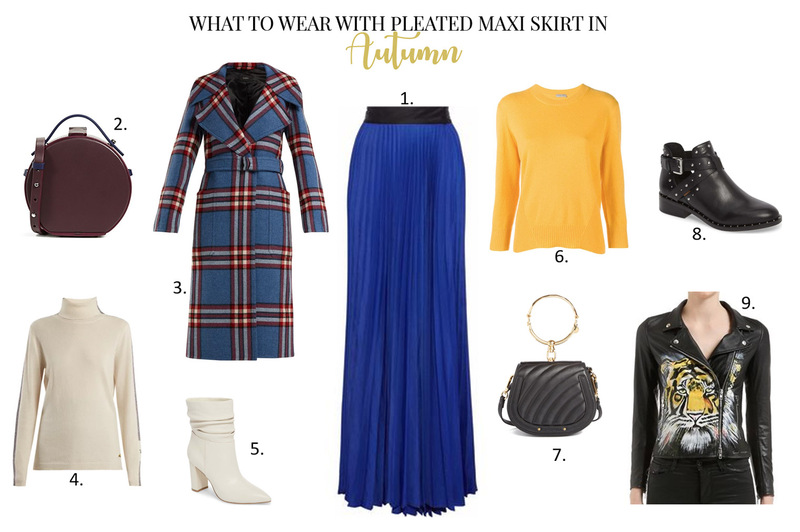 And what do you wear with pleated maxi skirt in the fall? 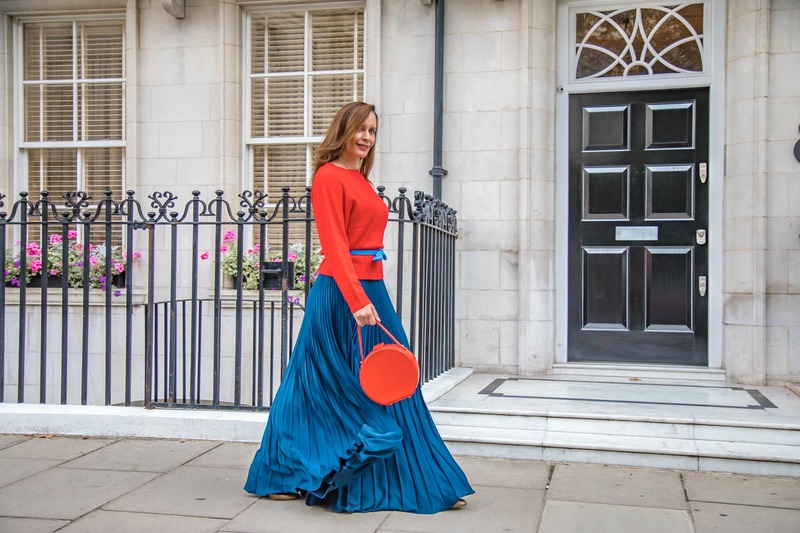 I’ve always lived maxi skirts but thought them a no no for autumn. I especially like look 3 with a jumper and leather jacket. This is such an acheiveable look. Thank you for sharing your different looks. Really like the skirt, especially when combined with the blue coat! I really love your look! Looks perfect! LOVE LOVE your blue maxi skirt! SO pretty!! !